Shot on the Marina Beach in Los Angeles, see our 3 American Legends from the mid to late '70s in Richard Baldwin, Skip Robinson and Doug Beaver. The guys are all in fantastic shape having just competed in national competitions. This is a classic film to video transfer with music added. Richard, Skip and Doug each oil, pump and pose in their individual film sessions with cameraman Wayne Gallasch who captures the best possible closeups with these stars. The posing was followed with a photo shoot. There is a brief segment in the Skip Robinson part where he competes against Joe Ugolik in the 1972 AAU Teen Mr America. The Skip Robinson Venice Beach, CA posing was shot soon after Skip won the Medium Class in the 1976 IFBB Western Hemisphere contest. Beaver is a muscular monster (pictured below), and was noted for his amazing arms, chest and superb abs, and Baldwin for his wonderful shape and symmetry. Robinson combined his movie star looks with a wonderful physique and superb posing. He was often the winner of the best presentation award. Photos by Wayne and video produced and filmed by Wayne Gallasch. Richard Baldwin - Super Tape: On DVD Also on Download. We have put together all of our film and video footage on Mr America RICHARD BALDWIN to make a fantastic original SUPER TAPE on DVD. Includes lots of pumping and posing, with full body and close-up posing, with emphasis on the best biceps in the Mr America contest of 1978. Plus a superb Photo Gallery. The second part of the DVD was filmed at “Muscle Rocks” near Malibu in July, 1978. Shot on a brutally hot day, with sweat dripping and muscles pumping and flexing, this sequence is a Baldwin classic. Many close-ups as DANNY PADILLA helps Richard pump up before Richard poses solo and then duo with Padilla. The duo posing turns into a posedown in this famous sun-drenched location! This video features three heavyweights posing on the Marina Beach (Los Angeles) in the late 70ss. All are clean-shaven, and display great arms -- triceps especially. He's ripped, with great muscle tone, flawless skin and extreme cuts. Then he does cable pull-ups from the ground (he's standing on the other end of the cable -- all three guys do this). He never smiles, and rarely looks at himself. A lot of the shots are closeup headless, with his torso and arms leaning into the camera. Arm shots are the best here, but his abs are shown to good effect. It's easy to see why he went so high in competition. The last listed competition I could find on him is the 1988 NPC Southern States contest, where he took first middleweight. Skip Robinson looks like a young Peter Fonda with muscles. He has scruffy long hair that blows in the breeze. He starts out in a red T-shirt and sunglasses, but they are soon off. A USMC tattoo is on one upper arm. He leaves his pants and leather belt on for a while, oiling himself up. Later he shifts to a yellow boxer swimsuit, and finally a black posing suit. The stretch cable shows off his massive chest and arms. Roadmap veins pop out on his shoulders and biceps as he works the cables. He flexes each arm one by one. As the camera pulls back, he hits the sort of poses Zane popularized in the late '70s. He smiles occasionally, but has a faraway look as he gazes into the distance, working to hit his poses. Emphasis is on his pumped arms, front and side views. After he does pushups, the shots of his torso and arms are chilling. His arms have character, with a distinctive look improved by the tattoo. Even with other body parts thrown in, including great shots of his abs, arms are his forte and he always goes back to them. This is a sustained look at an outstanding BB of the period, who competed in the AAU until 1986, when he took first in the medium (height) class at the Mr. World competition. Gallasch saves the best for last. Doug Beaver is a monster, with immense arms, chest, back, quads -- the works. He's got short dark hair, with sideburns. Throughout the film he grins at the camera, and appears to be having fun. He starts oiling up, with the camera on each body part as he rubs and flexes it. He's in competition shape, with great cuts, a narrow waist and speed-bump abs. Each body part looks like his best as he displays it. His arms get huge as they pump up from the cables. The shots of his biceps and triceps are classic -- some of the best I've seen. After ten minutes of cable work, Doug moves on to flexing and posing. A woman helps him oil his back, chest, and abs -- he flexes while she oils him. Her stature next to him makes him look even bigger. Now he's on his own again, in a black posing suit. His posing is excellent; he hits his poses dramatically, showing off all he's got. 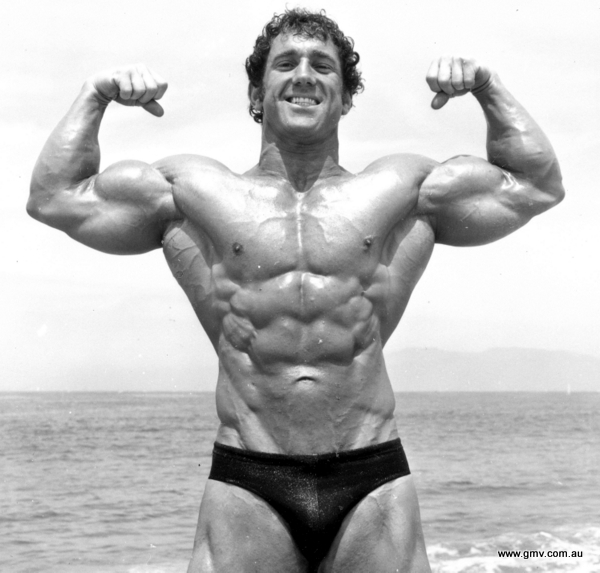 His "most muscular" crab shot is a heart stopper (and he won the "most muscular" award at the 1976 AAU Junior Mr. America). Great back, traps, legs, you name it he's got it. It's a crime this guy is not better known now; he last appeared in the 1983 NPC Masters Nationals, where he took the 3rd heavyweight award. A great DVD, strongly recommended.